Earlier this month, the BlackBerry Leap was introduced. This is a handset with a 5-inch screen offering a resolution of 720 x 1280. A dated dual-core 1.5GHz Snapdragon S4 Pro CPU is under the hood with the Adreno 225 GPU handling graphics. 2GB of RAM is inside along with 16GB of native storage. Those who need additional memory can turn to the 128GB microSD slot on board. The back and front-facing cameras weigh in at 8MP and 2MP, respectively and a 2800mAh battery keeps the lights on for up to 25 hours. BlackBerry 10.3.1 is pre-installed to keep you "secure and productive." This is certainly not a new high-end model, and BlackBerry has produced a video showing off the features of the handset. 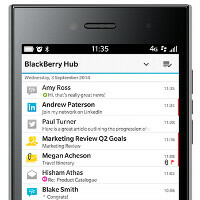 The unit offers the latest and greatest build of BlackBerry 10. BlackBerry Assistant is included as is the BlackBerry Blend app that allows you to view the content of your phone on a PC. The BlackBerry Leap is expected to be launched as soon as next month, priced at roughly $200 unlocked. For those waiting for BlackBerry's next flagship model, there is talk about a new device being prepped with hideable QWERTY keys. But this model could still be quite a ways down the road. If you want to see something that is official and will soon be launched, check out the BlackBerry Leap by clicking on the video below. Please stop. Give up already. Eww it has a dual core processor. True but the S4 Pro is a pretty capable one, more powerful than say a quad core Snapdragon 400. Im guessing BB must have had a glut of these processors from failed phones like the Z10, since I believe that phone used the same processor. The Z10 didn't use the Pro. It used the Plus, the same chip that was in the U.S. Galaxy S3 & HTC One X. The Droid DNA was one of the more notable phones that used the Pro later on that year. I can't think of any BB10 phones that have used the Pro, but you are right, it is still a very potent chip. Turns out this phone is actually using the Plus, not the Pro. And what's that processor on your beloved iPhone again? You're just as bad as he is if you think that this dual-core SoC and the A8 are in the same league. The A8 is a 64-bit custom chip and the S4 Plus is a 50 cent component from 2012. Are you going for a record at being wrong? I've owned 5 BB10 devices, countless Android devices, and every iPhone since the 3G...oh, and let's not forget, WP7 and 8 devices. If you're too stupid to even know basic SoC facts, I'll allow you to slink off and wallow in your ignorance. You're a troll who has already been proven wrong by BlackBerry today. Apiskula/JBishops, every couple quarters you come with a new account saying BlackBerry is done, and every quarter you get proven wrong. Aren't you tired of constantly being wrong? Says the guy whose favorite OEM still uses a dual-core processor in their flagship. You are the king of sticking your foot in your mouth. If you weren't such a douche, you would admit to the fact that number of cores isn't the most important thing when it comes to a chip's CPU, but I would never expect you to do that. Carry on being a fool. The real reason Blackberry use dual core CPU according to this article:http://seekingalpha.com/article/3033956-blackberrys-chen-guidance-increasingly-at-odds-with-reality quote: "The Leap uses a 2-year old Qualcomm (NASDAQ:QCOM) Snapdragon S4 processor. Why use a processor that's obsolete? Because it minimizes the design changes that have to be made for the new phone. In effect, BlackBerry is not investing anything in hardware, except for the bare minimum needed to keep introducing "new" but instantly outdated products. The Leap says that Chen has already thrown in the towel on Hardware and is unwilling to invest any significant resources. In my previous article, I said that Chen would have to make a decision about pulling out of Hardware. I now believe that the decision has already been made. BlackBerry as a hardware company has become little better than a comforting fiction for technically naïve investors." By you're logic, the Apple is doing the same thing with the iPhone. But when you check performance levels on these "outdated" BlackBerry devices, you see they perform just as well or even better than their counterparts. Props to Dr. Phil for calling you out on your BS. I have some videos for you to check out of BB10 running on old dual core processors and how well it handles multitasking and just the speediness of the UI: http://youtu.be/Hk_IyXTDLxQhttp://youtu.be/ZGVi60jqKVE I think those two alone go to show the powerfulness of hardware that is optimized for the OS and the work it was meant to do. There's more if you do a simple search. Had never heard of this thing until I clicked the headline. Blackberry used to be so powerful, it's a crying shame. Lot of bad business deals coupled with the ever-changing mobile industry led to the demise of this company. They should have sold it for parts years ago. Nothing better to do but troll huh? You've clearly been proven wrong today. Just like every other time. Do any of you trolls have a life? It's the Snapdragon S4 Plus, not the Pro. It's the same chip the Z10 used (MSM8960) and the chip debuted in 2012. The Pro series had Adreno 3-series GPUs. Good call. Makes more sense that they would use the Plus considering it was used in the Z10, Q10, & Classic. The S4 series, the Plus, the Pro, and the other one IS 100% PIN COMPATIBLE, and 99.9% 'driver' compatible.